Sacred Fools brings to the stage Sir Richard of Gloucester’s unwavering quest to wrest the royal throne from its rightful heirs in Shakespeare’s Richard III, January 20 – February 25. Just how far will Richard go, and what horrors will he visit on his land and family in his obsessive quest for the crown? Ben Rock directs Shakespeare’s dark masterpiece tale of sin and corruption; twisted, hacked, and reborn for 2012. The production will star Gregory Sims as Richard III, Leon Russom as Buckingham, Kathy Bell Denton as Queen Magaret and Kimberly Atkinson as Queen Elizabeth, along with Eric Giancoli as Hastings, Donal Thoms-Cappello as Catesby, Buck Zachary as Stanley, Cynthia Beckert as Duchess of York, Alexis Wolfe as Lady Anne, and Chairman Barnes as King Edward. 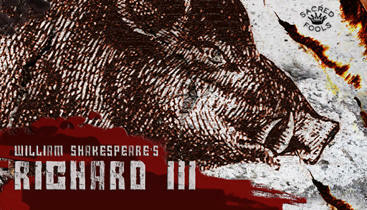 Richard III is produced by David Mayes, with Chris Millar and Gregory Sims. Sacred Fools Theater is located at 660 N. Heliotrope Drive Los Angeles, 90004. For tickets and more information go to www.sacredfools.org or call 310-281-8337.